For a long time Bosch was the go to brand for garden shredders. There is now a lot more competition. One of those competitors is the Dirty Pro Tools brand. As the name might suggest, they are a brand who focus on doing the tougher jobs around the garden and home. This review is about their Dirty Pro Tools Garden Shredder. It is the blade style type, and we think affordable for most gardeners in and around the £110-120 price point. Below we have done a very short summary for those of you who are in a hurry, and simply want the basics. In addition, underneath that brief summary, is a much more detailed review of this best selling blade garden shredder. This shredder will be a good choice for most gardens up and down the UK. Now I have often heard the phrase, boys and their toys. I own a lot of gardening tools that help me speed up the boring jobs. If people like to refer to these as toys, then let them have their moment. This is just a really useful tool, to get rid of unwanted garden waste quickly. The fact that it happens to be fun to use is just an added bonus for me. What is more important is what the real life buyers say. This is a relatively new brand to the UK Market. As I mentioned earlier, Bosch still dominate the UK market for shredders, but competition from brands like this, is starting to come in. There are about 100 online buyer reviews available for this product. We have summarised the key findings for the buyer's reviews. These are shown below with both the pros and the cons. It is one of the highest buyer rated shredders on the market with an average 84% buyer satisfaction rating. Only 3% of all buyers gave this one a bad review. 84% rate is one of the highest buyer ratings you will find, especially for a blade style shredder. Any of the poor ratings were down to jamming. That could have been user error. With these type of blade shredders, you do have to feed in a small amount at a time. You also need to avoid feeding in nothing but leaves as that will also cause jamming. Hopefully we have provided you with more than enough information. As blade shredders go the Dirty Pro ToolsTM Garden Shredder seems to do a really good job. With almost two thirds of buyers giving this the full 5 stars, they are happy with their purchase. The cable length is good, and that will help a lot of people to be able to locates this at different spots around the garden. That of course should save a bit of walking backwards and forwards. The 50 litre container is also larger than many found on other shredders. That will also reduce the amount of times you have to walk to dispose of the garden waste. We do like the idea, that you can quickly check how full up the container is, with a quick glance. It can shred branches up to 4 cm thick pretty quickly. Most of the buyers did say that this was not that great for leafy style of garden waste. That is however applicable to any shredder that uses blades for chopping up. The motor is bigger than most of this type. 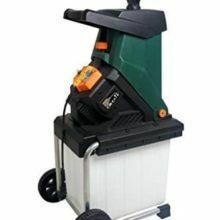 In almost all other blade shredders, you get a 2,000 watt motor. This model gives you 2,500 watts of power, so a tougher cutting capacity.​ It is also good practise to have a safety cut off switch on an appliance like this, and this one does. For most general gardening clean up projects, this Pro Tools shredder is a good tool to have. If you plan on doing larger projects, then we would recommend something tougher, such as a drum shredder. Likewise if you just want the job done quickly, we would recommend something tougher and more powerful. I would strongly suggest that you always wear heavy duty gardening gloves, ear protectors, and safety glasses or goggles. Those two inexpensive pieces will simply keep your hands and eyes safe and sound. With any power tool I always recommend an RCD. If you are using an extension lead to plug your shredder into, then I also recommend using the RCD with that as well.That gives you the best protection should anything electrical go wrong. We hope you found this review useful. 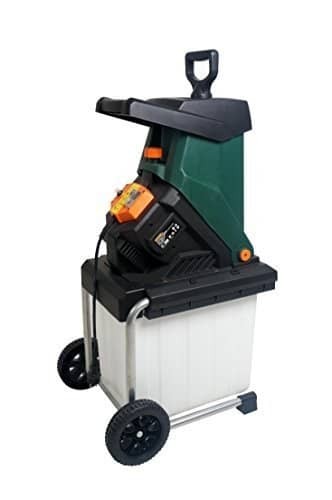 If this is not the shredder for you, then click here to see the full top 10 list of garden shredders. There are many to choose from, and hopefully one to suit your needs.